ASA, the American Supply Association, is the national organization that serves the needs of the PHCP-PVF [plumbing, heating, cooling, piping - pipes, valves, and fittings] industries. As an organization committed to employee training and education, the online ASA University is integral to their mission and a robust value-add for their distributor members and suppliers. 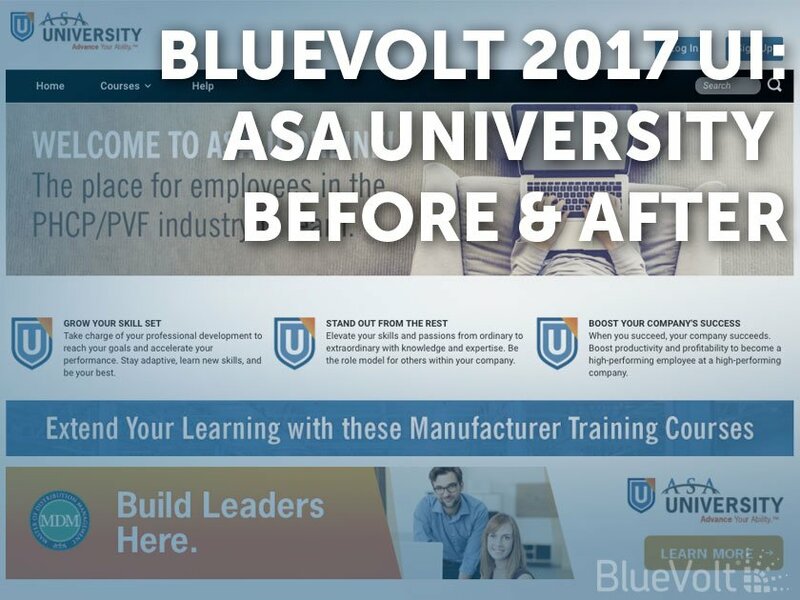 Recently ASA University migrated onto the 2017 BlueVolt UI, completing the online University redesign and implementation themselves. Jessica Thacker, the Education Programs and Services Administrator for the ASA Education Foundation, shared the challenges ASA was facing prior to the redesign. "The design of the old University was clunky for learners to use and find the content," Thacker notes. "They couldn't go through the course catalog easily, and got overwhelmed at the number of courses the search function brought up. We have a lot of users who switch back and forth between Universities and so they were struggling with this functionality as well." Thanks to the BlueVolt team's provided wireframes, redesigning the University on the 2017 UI was a snap. "We felt enabled and prepared to decide how we wanted it to look," says Thacker. The ASA team prepped images to fit the wireframe layout specs they chose, and loaded everything into a staging environment to test how everything looked. "It was pretty 'drag-and-drop,'" she says. "Changing block layout settings was really easy and very visual." With the University design complete, the ASA team crafted their own catalog pages and configured their new navigation and theme settings. They also went through their course catalog and applied tags to courses to allow for easy Search. 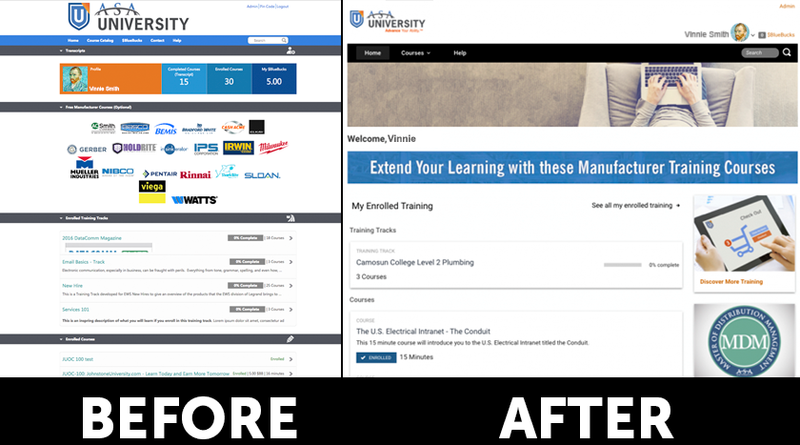 After the redesigned ASA University went live, learners immediately noticed a difference. ASA was able to show their expanded course catalog, as well as display their training tracks clearly for learners. The newly-implemented course tagging allowed courses to be easily searchable, filterable, and more visible. University Admins were also able to organize and administer courses better because of the improved tags. ASA also recently surveyed their key user group and received positive feedback on the improved ease of access in the University: the users praised that courses were now really easy to find, and said that they were impressed with the professional look and feel of the University. For Thacker and the ASA team, this was a big win. ASA learners are able to find what they need more quickly, as well as find similar courses and training tracks without spending time searching for relevant topics. University Admins are better able to administrate and manage a large - and ever-growing! - course catalog. With the ease of use and intuitiveness of the 2017 BlueVolt UI, all customers regardless of their design abilities, are enabled to DIY their entire University on their own. Expert Tip from ASA: When approaching a redesign, taking the time to lay out everything in a visual storyboard is extremely helpful! Use the BlueVolt-provided wireframes, cut up each section of the online University, and storyboard the pieces. This really helps with visualizing the image sizing, layout, and identifying the total number of images needed. Piecing out a University redesign project in this way and laying it out fully before you change anything online, ensures that you have all the parts you need - and the process becomes simple and easy to execute.